That evening I made myself a Tuna Pasta Bake. The Doctor doesn't like tuna so I don't make this often, but I made him some pasta with a spicy tomato and bacon sauce so he was happy! That green is so springy! And I love casseroles! Absolutely love the green of the thread. I've seen it quite a bit in magazines lately so I have a feeling you are right on trend! Will be making a tuna pasta bake this week! Your shot is just great, and I love the color. 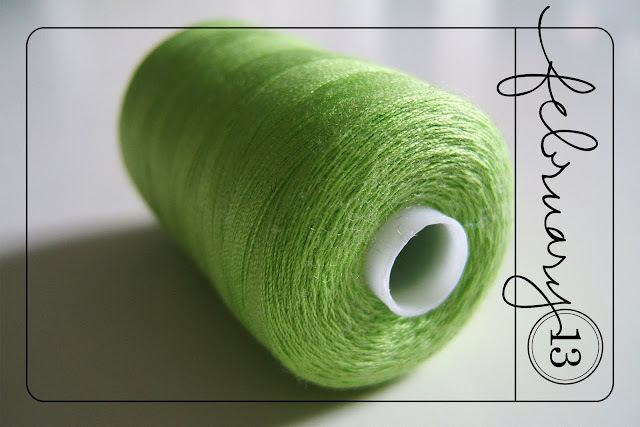 LOVE the bright green spool of thread - one of my favorite spring colors. I haven't had tuna bake in ages ~ yummy! Beautiful shade of green (I known as the queen of green in our house because I love it). Pasta bake looks delicious! Assuming I can get some broccoli this will be on my menu next week. I don't willingly eat tuna but my family like it and I know it's good for me. I do love green and greens. I love that colour green, it's so fresh!